Recycling is the law. If your recyclables are mixed with your garbage, they will not be picked up and you'll receive an orange Oops! sticker. Don't let your garbage be left behind. Make recycling a priority. Please keep glass, plastics, metal and paper (including newspaper, magazines, catalogs and junk mail) out of your garbage. If you are an owner of a multi-family dwelling, contact us for assistance to improve your recycling program. The Daniel P. Thomas Material Recovery Facility ("MRF"), where 90 percent of the residentially collected recyclable material in Westchester County is processed, recently underwent a five-month retrofit. Now high tech optical sorting equipment shoots thousands of laser beams per second through each plastic container to identify the resin type. This allows the county to continue recycling plastic containers coded 1 and 2 and also collect and recycle containers coded 3 through 7, including yogurt containers, plastic cups and take-out food boxes. On June 1, 2011, plastic containers coded 3 through 7 were added to the county’s list of mandated recyclables, under the Westchester County Source Separation Law, and now residents must recycle plastics coded 1 through 7. Do not put plastic bags in your bin, these should be brought to retailers that are required by law to collect and recycle them. Also, continue to put styrofoam in the garbage. Read the Quick Recycling Guide for information about everything else. You can also call (914) 813-5425, the Recycling HelpLine, for more information or if you have additional questions. Also, paper and commingled recycling bin labels are available to be printed and used in your home, office, school, institution or business. Many household items that cannot be set out for curbside collection can be safely disposed of at our Household Material Recovery Facility (H-MRF). Confidential documents can also be safely recycled using the county's Mobile Shredder. 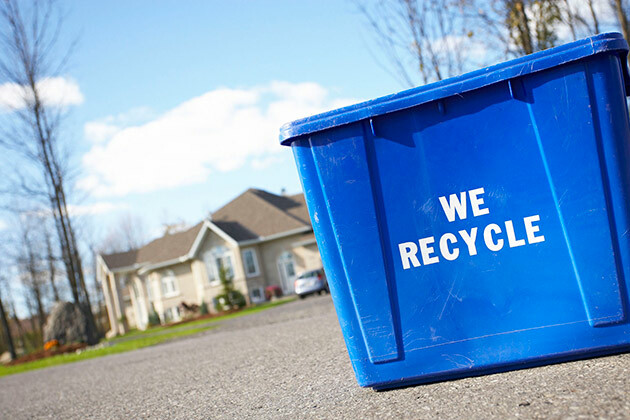 Miss a recycling pick-up at your curb? Contact your local sanitation department for a schedule of pick-ups of paper and "commingled" (glass, plastic and metal) recyclable materials. If your city, town or village sanitation department picks up your recyclables, you can contact your Municipal Recycling Office directly. If you have a private hauler, contact them. If you live in an apartment building, your building manager or superintendent can tell you how trash should be separated in your building. One significant way that everyone can contribute to environmental conservation is through waste reduction. In addition, old products can also be donated to reduce additions to the waste stream. Charities accept old furniture, clothing, toys, and other items for reuse.